Confirm you have the Zonolite Brand of vermiculite insulation. (We can help with that) NOT ALL VERMICULITE QUALIFIES. We process your claim (in the order it is received). There are very specific rules that must be followed. You must incur expense before receiving reimbursement. Documents, documents, documents! We must have acceptable proof of the amount of money you ACTUALLY spent. If you have questions, check out the rest of the website to get all the information you will need, ESPECIALLY the 'Claim Form Instructions' and our FAQs. STEP 1. START A CLAIM. Even if you are not sure if you have the Zonolite Brand, go ahead and open a claim. We will help you determine if you have this product. You authorize the ZAI Trust to contact any of your service providers to verify the accuracy and authenticity of the documentation you submit and, if deemed necessary, send a home inspector to your property to verify your claim. 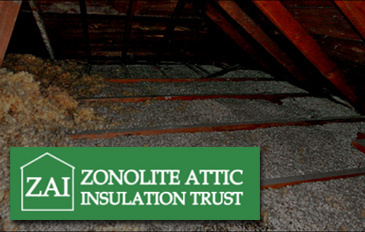 If it is determined that you have the Zonolite Brand, you are under NO OBLIGATION to have the insulation removed or contained (even if we have paid for the testing). Your claim will remain open until you decide to move forward with abatement or withdraw your claim. STEP 2. SHOW PROOF THAT YOU HAVE ZONOLITE BRAND VERMICULITE INSULATION. LABORATORY RESULT. Send us a sample and we will test it at NO COST TO YOU! ZONOLITE BAGS. Do you have actual Zonolite bags that have been left in the attic? See 'Claim Form Instructions' and FAQs. ZONOLITE RECEIPT OR INVOICE. Do you have an original receipt or invoice showing the purchase/installation of Zonolite? INDEPENDENT LAB TEST. Has the vermiculite insulation already been tested for asbestos by an outside lab? An independent lab test that confirms the presence of Libby amphibole may be considered as acceptable proof that the product was Zonolite Brand. Submit the lab report with your claim form. Before and after photos (COLOR PHOTOS PREFERRED!) The Trust can only accept original photos. Any photos submitted in PDF format will not be accepted. Copy of canceled check, bank statement, or credit card statement (Cash payments are subject to heightened scrutiny). Note: an invoice marked "paid" is NOT sufficient for fulfilling this requirement. Please redact any account numbers on payment documents. STEP 4. WE PROCESS YOUR CLAIM. The length of time it takes to process reimbursement checks is influenced by many factors, including the time it takes to receive all the required documents, volume of claims being processed, and the order of the queue (FIFO order) as indicated by the time and date the claim was submitted with the ‘Ownership Declaration’ signed. To start your claim online, click on the ‘Online Claim Form’ tab, or click on the 'Forms' tab to download printable copies of the 'Claim Form' and 'Claim Form Instructions'. Paper copies can be submitted to us by email attachment or returned to us by U.S. Mail.